Anyone looking for an epilogue in the brilliant Avenged Sevenfold (A7X) Nightmare saga, look no further than the single 4:00 AM that was released as part of a deluxe three-song digital single on iTunes. The previously unreleased b-side, recorded with drummer Mike Portnoy, is as compelling as anything recorded on Nightmare. Warner Brothers bills it as the last Nightmare song. The name of the new, previously unreleased single, 4:00 AM, likely alludes to the hour that the band finished the Nightmare album. Shortly after finishing, Vengeance had posted: "Tracking is complete. There are no words that will ever describe the feeling of listening to this album while driving home alone at 4:00 AM." The lyrics express how once we finally find the words, there's no one left to tell. 4:00 AM Is A Song That Reflects On Those We Leave Behind. The song provides another nod to the late James "The Rev" Sullivan and a fitting way to conclude the relationship forged with the masterful Portnoy. Sullivan had credited Portnoy as an influence. "For the past few months, we've been blessed with Mike Portnoy's talent and humanity. 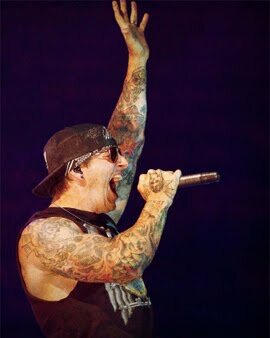 When Mike agreed to tour with us, it was only through the end of 2010," reads the A7X Dec. 17 message. "We always knew we'd need to find another solution for 2011 and beyond. And it's time for us to take that next step." Beginning with the Nightmare After Christmas tour, A7X will introduce a new drummer to A7X fans without calling him a member until the family and fans feel it to be a fit. If it is a fit, he will be added to the roster that currently includes Matt "M. Shadows" Sanders (vocals), Zacky Vengeance (rhythm guitar), Synyster Gates (lead guitar), and Johnny Christ (bass). The Rest Of The A7X Deluxe Offering On iTunes. The deluxe Welcome To The Family single also includes Welcome To The Family (a song originated by Sullivan) from the Nightmare album and a live cut of Seize The Day, recorded in Seattle. It is from their third album, City of Evil. Here's the long version of the song, live, from the LBC archives. The Seattle version is equally strong, if not stronger. "It's about taking the people you love and holding them close," Shadows said about the song then. "You make some mistakes in life and that can all be taken away from you in two minutes, so you have to think twice about your actions." 4:00 AM By Avenged Sevenfold 9.8 Completes On The Liquid Hip Richter Scale. Purchasing the complete single comes with 30 photos of the band shot by photographer Greg Watermann during their 2010 co-headlining stint at the UPROAR Festival. The photos are highly stylized, with heavy graphic borders, most set two to a page. Curiously, while Portnoy's drums can be seen in some backgrounds, there are no clear shots of him. The Welcome To The Family - Deluxe Single is only available on iTunes. For Nightmare After Christmas tour dates, visit Avenged Sevenfold. The first concert is scheduled for Jan. 20 in Reading, Pa.